Pork bangers: Place a pan on medium-high heat with a drizzle of olive oil. Add the sausages and brown for 3-4 minutes until golden (not cooked through yet). Remove and set aside. Smoked paprika mix: Using the same pan on medium-high heat, add the onion with a pinch of salt and cook for 5 minutes. Then add the garlic, bell pepper and courgettes and sauté for 3-4 minutes until golden. Add the tomato paste and smoked paprika, cook for 30 seconds, then add the grated tomato (and the liquid from the tomato) with water (¼ cup for 1), season with salt and pepper and add the sausages back to the pan. Let it simmer (gently boil) for 10 minutes until the sausages are cooked through (add more water if necessary). Season to taste. 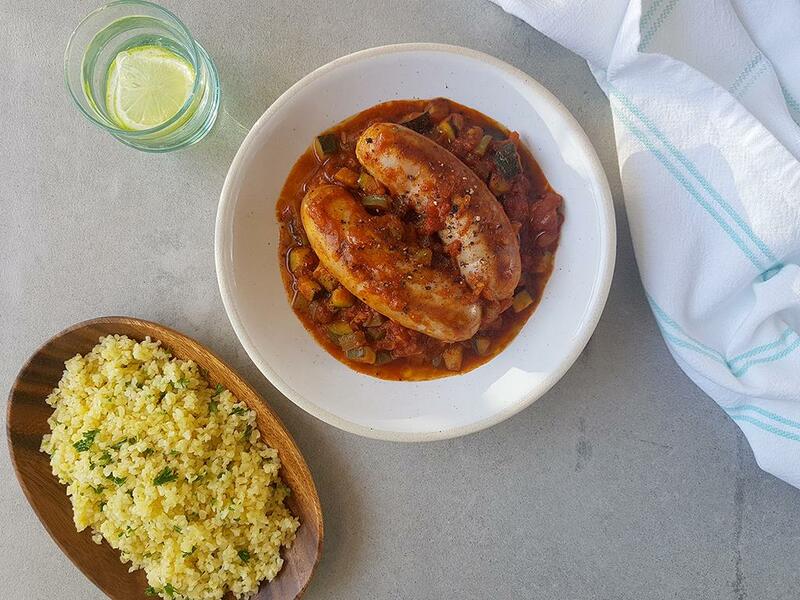 Serve by mixing the parsley through the bulgur wheat and serve with the saucy bangers.